Sometimes looking around our house stresses me out. And it’s not just the house, either! Clutter can take over very quickly. Even after you reduce your clutter, it comes back. Clutter is something you have to stay on top of. As I’ve looked around my house, and my life, I’ve found a few ways that I can get rid of clutter fast. Some people don’t mind clutter. If you’re one of those people, good for you, I suppose. But even if it doesn’t bother you, clutter still has many negative effects. Takes Up Space. Clutter takes up space that you could use for other things. Or, in some cases, like if you have to rent a storage locker or have to buy a bigger home, it can increase the space you need. Space costs money! Wastes Time. If you aren’t sure where something is, it’s going to take you a lot longer to find it if you have a cluttered life. Every minute you spend searching for something is a waste of time. This is time you could be doing something more productive or enjoyable. Clutter won’t ever stop, but it can be addressed. Here are some ways that I plan to get rid of clutter. We have a lot of toys that the kids have outgrown. Specifically, in the basement playroom, the stuff they’ll never use grows bigger by the day. I spent a great deal of time separating their toys, and created a pile of things to sell or donate. I plan to do this as part of our 2019 goal to sell a bunch of stuff on Facebook Marketplace. In another corner of the basement, we have a pile dedicated strictly to items that were for when the kids were babies. This includes things like a high chair, a pack-and-play, and other such items. All of them are in pretty good condition, so we can likely sell them. It’ll be interesting to see how this goes, though. Last year we purged our collection of strollers, and I was surprised at how much I had to lower the price before they sold. But, as I thought about it, things made sense. New parents want new things. We sold our camper at the end of summer last year. We did get a new one (a story for another time), but it was so late in the year we never loaded it back up. When spring hits and we bring it home, we’ll be able to go through all of the gear we have and see what we need and what we can part with. I have never had a spot for my tools. I’ve stored my tools in two completely different spots. Half of them went in the garage on a work table. The other half went in the basement on an old desk. I didn’t have room to move either half to the other half. Thankfully, the end of this is in sight. Santa was good to me over Christmas, and I ended up with a brand new tool chest. It’s mostly assembled, but with the winter weather, I haven’t had the motivation to spend time out in the garage getting it finished. It’ll take a while to re-organize everything, and I know I’ll have the desire to do so once spring hits. Technically, this is underneath the bathroom sinks. I was recently re-stocking toilet paper through the house, and I took note of the condition of the cupboards under each sink. In each case, I peered in and was able to see that we have stuff under each sink that can be cleaned out. Half bath. We have a bunch of scented oils that we haven’t used in years. Some have probably evaporated. We can clear up quite a bit of space here. Master bath. We don’t have a medicine cabinet, so underneath our sink is where unused meds go to live. I know that we have stuff that’s been in there for over 5 years. Probably longer than that for some. There’s definitely an opportunity here. Kids bath. This just needs a general cleaning and re-organization. We keep a lot of stuff here that we stock up on. Toothpaste, toothbrushes, soaps, and the like. I know we have things here that we probably keep buying because we’ve forgotten that they’re here. Re-organizing will probably save us some space and money! 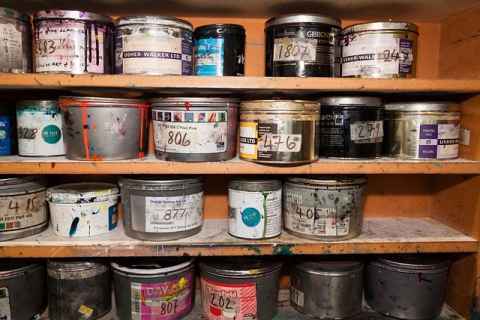 Old paint cans add up and create clutter. We have shelves in our basement that store a lot of things. Some of them are useful. Others, not so much. I want to go through shelf by shelf and weed out the stuff we don’t need. I last did a paint purge a few years ago. It’s probably time once again. Our kids both love their toys, and they seem to keep every one that they’ve ever had. My daughters closet is teeming with toys. She has so many that she never plays with that she can’t find items she actually wants to play with. A good purge will be good to clear space. It’s also fun because she can look at toys that she no longer wants and remember the fun she had with them. I did this with my son over the recent holiday break, so I know it works well. He has a much cleaner closet these days! I’ve been at this for close to ten years. I have so many posts and plugins and things that have simply accumulated. It’s time to do some cleanup. I’ve been working on this. I have always done everything with this blog myself, but I’m actually now realizing that I need some expert guidance, and plan to reach out soon, once I have a full list of items put together. We primarily use three credits cards. There are at least three others that we have that we don’t use at all. It’s time to clean these up. We’ve often heard that keeping older cards is advantegous because it shows a long history, which is one reason we’ve kept them for so long. But, even out of the three we use now, we’ve had them all between 4-10 years, so I wouldn’t anticipate any punishment from closing a card that’s only a few years older. Any thoughts from expert readers? We have two high yield savings accounts. Both offer similar returns and basically do the same thing. Both used to have unique benefits that made having two a sensible option, but whatever those benefits were have been gone for so long that I don’t even remember what they were! Having both of these open is something we’ve allowed to persist simply out of habit. Still, it’ll mean one less account to track all throughout the year and at tax time. Honestly, this could spawn off other items. For example, I have two 401(k) plans, one from my current employer and one from my last. I’ve never merged them, because at the time, the offerings and costs made sense. Do they now? I should probably check. If I get through all of these items this year, it’ll be a major accomplishment. These aren’t part of my formal goals for the year, but it’s still something that’s important to me. Readers, what are your clutter reducing tips? Do you have any target areas and goals set for keeping clutter at a manageable level? Good luck with the decluttering. It’s a lot of work. We’re moving and trashed, recycled, and donated a ton of stuff. I not only have the original XBox, I still play it sometimes! I’m trying desperately to keep the closet in my bathroom organized. I keep all my spare stuff there, from cold medicine to extra toothbrushes and toothpaste to pain relievers and so on. Not to mention that the bottom shelf is devoted to painting supplies and extra paint I have lying around. Tim reorganized the whole thing shortly before the divorce, which cleaned it up a bit but also means I have less of an idea of where everything is. It’s a double-edged sword. So I’m trying to peruse it from time to time (and always when I run out of something) to make sure I know what’s in there so that I don’t buy duplicates. I still suspect I’ll end up with multiples of a few items though. Luckily, it’ll all get used eventually. Though I should really toss some of the older cold meds. I’ve always wondered if cold meds go bad or if they just get less effective over time. The one in, one out rule might help. Good luck and congrats on 10 years here!